It's been too long since my last Five Photo Friday. Could it really have been a month? Apparently so. What have I been up to? Plenty. I haven't taken a whole lot of photos though. Some things don't lend themselves to pictures. For example, I am deeply entrenched in an online class for finance and accounting. Do you really want to see a photo of me staring at a balance sheet? I didn't think so. I also have spent a good bit of free time reading a couple of books — "You Are An Ironman" and Hal Higdon's "MARATHON: The Ultimate Training Guide." I agree with the linked review of "Ironman," and I wish I had read Mr. Higdon's book a lot sooner. Training-wise, I am now completely committed to running. The Dallas Marathon is not too far down the road. Before then, I will race the DRC Half next month. The good news about my training. I am getting faster. The shot above is my time around White Rock Lake. About 9 miles (9.1, not the 9.33/15K as many believe) in 1:08:31. That's about 20 minutes faster than what I was doing this time last year. Fast = fun. What's made the biggest difference? Running the hills of Lake Highlands two to three times a week. Riding my bike a ton this summer didn't hurt either. Something else that has helped my running is drinking fewer beers. They really do go straight to the gut. It ain't called a beer belly for nothin'. What you see above is a quasi-rare six-pack of Deep Ellum Brewing Co.'s Rye Pils. DEBC started selling its beer about one year ago, but solely at restaurants, bars and pubs. Now you can get sixers at certain Sigel's. Pro tip No. 1: You have to ask the sales staff to fetch them. DEBC beers are not in the coolers. Rye Pils, Double Brown Stout and Farmhouse Wit are available at the Sigel's on Greenville Avenue ... while supplies last. Pro tip No. 2: You can tour the brewery every Thursday and Saturday (link also shows where you can find the superb brews). I'm not much of a team sports player. What's worse, growing up in Texas, I was a lousy football player. But I do appreciate the sport and I can be convinced to watch a game from time to time. 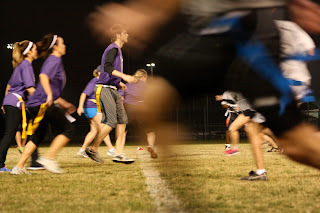 When my company announced the formation of flag football teams I was quick to say I wouldn't play but equally quick to say I'd attend a game or two to take pictures. Now, I'm not a pro photog, but I used to roam Friday night sidelines backinnaday to snap a few shots for publications. 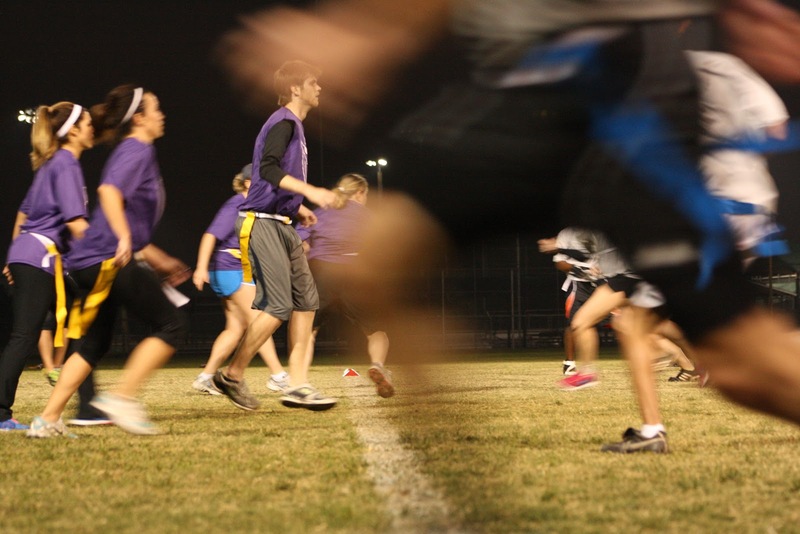 I'm a little rusty, but I sure did have a great time capturing coworkers having fun competing on the gridiron. Speaking of teams, get a load of that hot T-shirt created by the greatest girlfriend a goofy guy like me could ever imagine. Yep, Team TR13CE. How did I get so lucky?